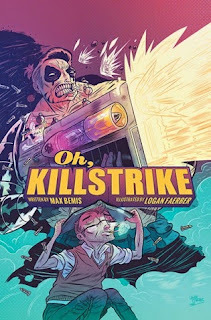 The Fellowship was fortunate enough to obtain a copy of OH, KILLSTRIKE #1 from BOOM! Studios. Max Bemis writes, Logan Faerber draws and Juan Manuel Tumburus colors. Jared is a new dad and a comic book fan. He’s come up with a plan to sell off a book he’s had for years, the most hated comic in recent history. When he visits his mom’s house to get the book out of storage, something odd happens – the comic’s main character, a beefy antihero named Killstrike, appears in the attic. Jared thinks he’s losing his mind, but Killstrike follows him home and asks for his help to get back to his own world. This is certainly an interesting way to tell a story about facing one’s fears. Jared is a guy with plenty of them, too – fatherhood is scary and stressful, and that’s just the beginning. His claims that he can no longer stand the books he loved in the ‘90s also say a lot about the psychology of growing up in our society, but I’m afraid to read too much into that here. The art flirts with reality just a bit, pushing the boundaries with the contrast between Jared and Killstrike, in a really cool way. There’s a lot in this book that a comic book fan might find intriguing (I certainly do), but the underlying story will appeal to any reader. It’s definitely a picker-upper. OH, KILLSTRIKE #1 is available now at your FLCS or at boom-studios.com.